You can feel at home here. This flat is not in a complex where there might be issues with noise-sensitive neighbours. It is in a 3-storey detached building that comprises only one other residential home. The flat's private entrance door opens directly onto a quiet street. All rooms except the toilet have a window. There are adequate storage closets for luggage, clothes, and possessions. A double sofa bed is in an area that faces the kitchen. It easily converts from a sofa into a comfortable bed with ample space for two people. 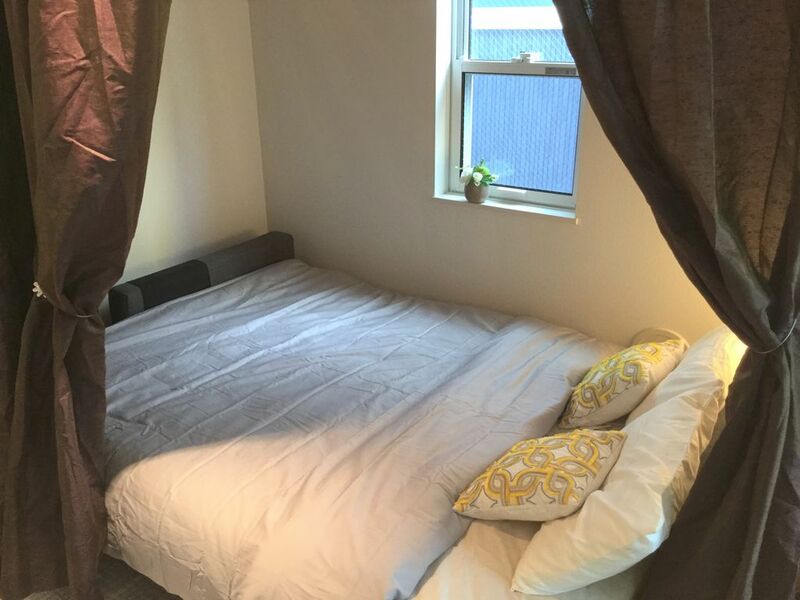 It has a curtain that can be pulled around for privacy. The separate bedroom has two single beds, and a fifth guest would need to put down a good-quality, comfortable futon floor mattress. All bedding (all bought new) is supplied. Your group will share none of the amenities described. You will be able to cook and prepare food in a kitchen equipped with a halogen range, microwave oven, fridge, toaster, kettle, pots, pans, and cooking/eating utensils. The bathroom has a shower and hot tub. There is a laundry-washing machine and space for clothes drying. The toilet is separate. Translation to English supplied for appliances' usage instructions, remote controls, etc. It's a self-contained flat. Fully furnished and equipped. For the exclusive use of a group of up to five guests. We (the hosts) live in the other residential property in the same building. You can come and go through your own private access door, but you will easily be able to contact us if you need to. We're happy to chat and offer advice and ideas if we have experience that will help. We can usually give accurate directions to get you from A to B. That sometimes takes a few minutes, as we might have to look up the info ourselves. But we're good at tracking down the info you need, so don't be shy to ask. If there is anything you need or any problems at all, please be sure to let us know as soon as you can. We always do our best to make things right. Early check-in and late check-out is just not possible at this time. Sorry, but our current set-up makes it too difficult to organize. Check-in time is 4pm-midnight and check-out time no later than noon. Luggage storage before check-in or after check-out is possible if arranged in advance. Just ordinary folks in Tokyo who have comfortable space to spare, so HomeAway is a perfect match for us. We have lived, worked and travelled overseas extensively, now we've settled with our pets in Japan's lively capital. We're ready and waiting to help make your stay here peaceful and pleasant. You can feel at home here. This flat is not in a complex where there might be issues with noise-sensitive neighbours. It is in a 3-storey detached building that comprises only one other residential home. The flat's private entrance door opens directly onto a quiet street. All rooms except the toilet have a window. There are adequate storage closets for luggage, clothes, and possessions. Your group will share none of the amenities described. You will be able to cook and prepare food in a kitchen equipped with a halogen range, microwave oven, fridge, toaster, kettle, pots, pans, and cooking/eating utensils. The bathroom has a shower and hot tub. There is a laundry-washing machine and space for clothes drying. The toilet is separate. Translation to English supplied for appliances' usage instructions, remote controls, etc. The best of both worlds: A quiet night's sleep in a safe, peaceful residential area with plenty of local stores and eateries in walking distance; And in minutes you can be in the thick of the action in central Tokyo's lively districts such as Shinjuku and Shibuya. toilet, tub, shower, ...plus a wash basin and laundry area. Bathroom/toilet summary: To be clear, the bathroom setup is one full bathroom with mid-size hot tub and shower, a standard wash basin, and a laundry area; plus there is a separate toilet with a built-in bidet (Japan style). There is only one toilet, not two.